AlzeCure is a Swedish public limited company and is governed by Swedish legislation, mainly the Companies Act (SFS 2005:551) and the Annual Accounts Act (SFS 1995:1554) and internal rules and regulations. The Company has applied for the Company’s shares to be admitted to trading on Nasdaq First North Premier. If the application is granted, the Company must also comply with Nasdaq First North’s rules and the Swedish Corporate Governance Code (the “Code”) and statements by the Swedish Securities Council regarding good practice on the Swedish stock market. As a general rule, the Code does not apply to companies whose shares are accepted for trading in a so-called multilateral trading facility (such as Nasdaq First North), however, as of 1 July 2018, the Code applies to companies whose shares are accepted for trading in the Premier-segment of Nasdaq First North. The Code provides for a higher norm for good corporate governance standard than the minimum requirements of the Swedish Companies Act, but companies do not have to comply with all the rules in the Code, as it allows for deviating from the rules, provided that all such deviations and the alternatives chosen are described and the reasons for the deviations are explained in the Corporate Governance Report (the so-called “comply or explain” principle). The Company intends to comply with the Code, subject to the deviation that a nomination committee will be set up at the first Annual General Meeting after the Company’s shares are admitted for trading on Nasdaq First North Premier. 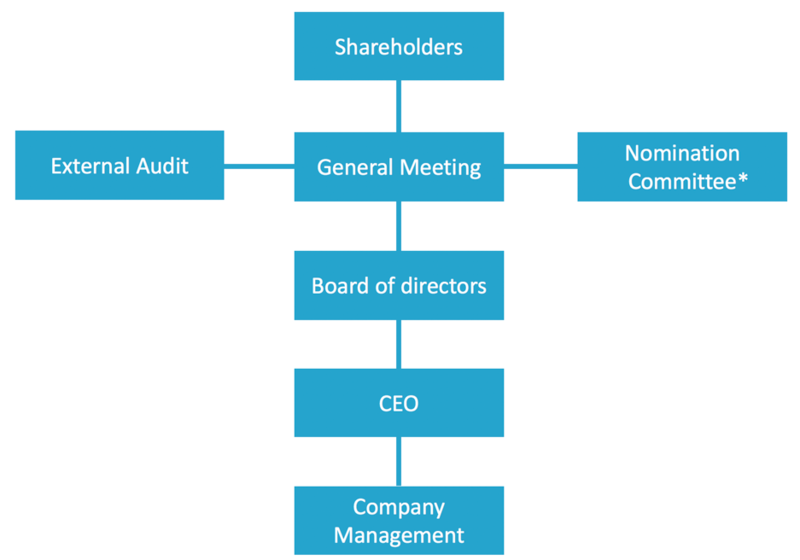 *The company intends to appoint a nomination committee on the first annual general meeting held after the company’s shares have been listed on Nasdaq First North Premier.